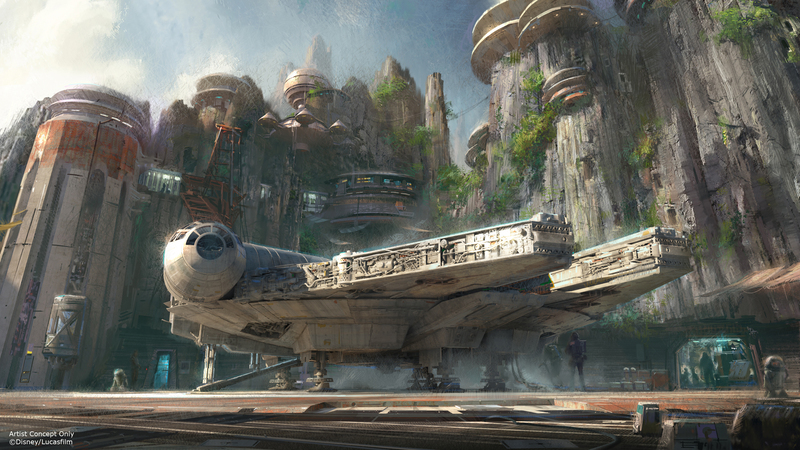 Today at the D23 EXPO 2015, The Walt Disney Company Chairman and CEO Bob Iger announced to an audience of more than 7,500 fans that Star Wars-themed lands will be coming to Disneyland in Anaheim and Hollywood Studios, allowing Star Wars fans to step into the stories from a galaxy far, far away. ARTWORKS: ©2015 Disney. All Rights Reserved. I think they forgot to mention it will be about 8+ years before it opens with their current track record. I wish they would take a page from Universal and starting building things and then about a year before opening, announce it. This is going to be Avatar all over again. Who wants to bet that the other attraction that "puts guests behind the controls of one of the most recognizable ships in the galaxy, the Millennium Falcon, as they take on a customized secret mission" is just going to be Star Tours with a new name and different queue at Hollywood Studios? I will say, the pictures do look good. However, not picking a known location is going to be another issue. HP works so well because people get to visit places they have seen in movies and read about in books. Sure, this land will take place in the same world, but none of it will be something fans will be able to say "I remember that from movie "X"". On the plus side, at least Hollywood is finally get something! I just hope they don't use the same emaginears and or construction crews that worked on the Seven Dwarfs Mine Train. We don't need another D ticket ride and at the age 50 I would like to see this land before I'm stricken with Alzheimer's or die of old age. DHS let me down, yes Star War's Land is cool and will probably be amazing, the biggest let down is definitely Toy Story Land. Much rather have an Monster Inc Door coaster and a cool Incredible's themed dark ride and i would even take a clone of crushes coaster at DLP. But this is just lame even the slinkily coaster. I can understand the apprehension of those above however, this has so much more potential and appeal than Pandora. I still think Pandora was and is a huge mistake. I was hoping that there was a mixed Pixar Land, as well. It would be a much more interesting Pixar Land if there were different movies represented, instead of the whole place being like a giant Toy Story shrine. I disagree with the comments about Pandora above, but we're all entitled to our own opinions. I think comparing Pandora with Star Wars is apples and oranges, aside from the fact that they're both sci-fi. I personally can't wait to visit both, and I think Pandora at night may be the best attraction at all of WDW if it will really look like the illustrations they've released. Termite mounds. Giant termite mounds. It takes Disney 6 months to paint a fence. I don't expect this to be finished in 7 years. Universal puts up attractions 18 months compared to 4 or five years for Disney. Making up some fictitious planet is a way they can dodge criticism for a known location. This will not put Disney back on top, not at all. If it takes ten years to build, Universal would have put up 5 times of attractions. I agree about Harry Potter, it works phenomenal well because the settings represent, as close as possible, the places we wanted to go to when we read the books and saw the movies. If Harry Potter were set in all new locations in the Harry Potter universe no one, myself included, would care because we would have no connection with any of the settings having never seen them. STAR WARS LAND is making a huge mistake by creating a whole new planet for the setting rather than a location from the original movies we've wished we could visit. Just sticking STAR WARS characters in a location we don't associate with the movies is a bad move for the project. Who wouldn't want to go to Hoth and wander through the rebel base and through the hanger with the Millenium Falcon surrounded by snow speeders and X-Wings? Visit the Death Star, walk aboard an Imperial Star Destroyer, go to Dagoba, Tatooine, Bespin, Alderan, Yavin? This all new setting makes no sense and in a stylistic sort of way looks more like a location from the Avatar universe, not STAR WARS. 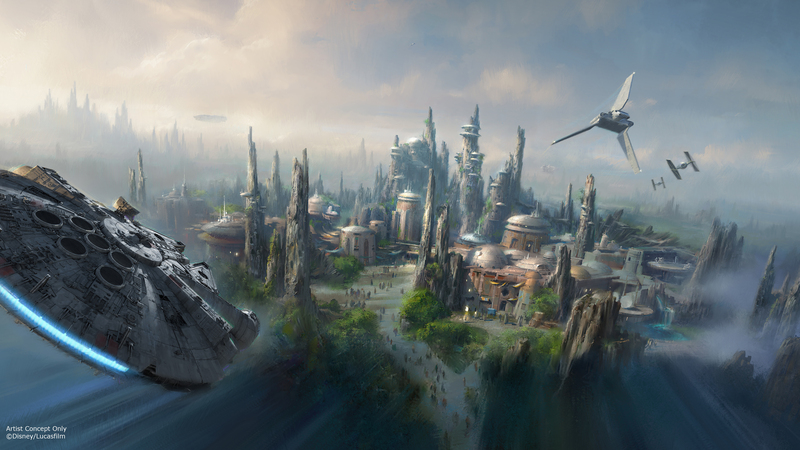 I don't care about the land since I have no connection to the 14 acre new mystery planet, even with WDI dropping STAR WARS characters on this generic planet setting doesn't make me excited for the setting the only thing I'm looking forward to are the attractions. It's a huge disappointment to this STAR WARS fan. So where are they putting this? Admittedly I'm not a big Star Wars fan, but I think this is actually a masterstroke on the part of WDI. The biggest issue with the Star Wars universe is the size of it. Yes, it would be great if people could visit real locations from the movies, but the fact of the matter is there are just too many. It's not fair to compare against the Harry Potter universe, since there are only really a couple of key locations from the books (to be honest, Universal will be stretching it a bit if they do opt for the Ministry of Magic as a third "land"). By taking this approach, WDI have ensured they can bring in all of the most loved characters and aspects of Star Wars without disrupting the integrity of the "story" of the new land. And that's not to mention the fact that the concept art looks amazing.